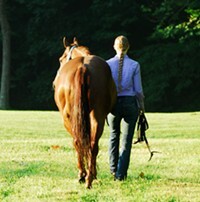 At Meredith Manor we are committed to a teaching and learning process that will provide our students with the critical skills necessary to enjoy life-long careers with horses. We are committed to teaching these skills in such a way as to enable our students to deal with horses in all aspects of the industry in the most humane manner without the use of force or punishment. Our mission is to prove the superiority of humane methods through our graduates. We hope you have enjoyed our tour. If you are interested in attending Meredith Manor we encourage you to schedule a live tour.